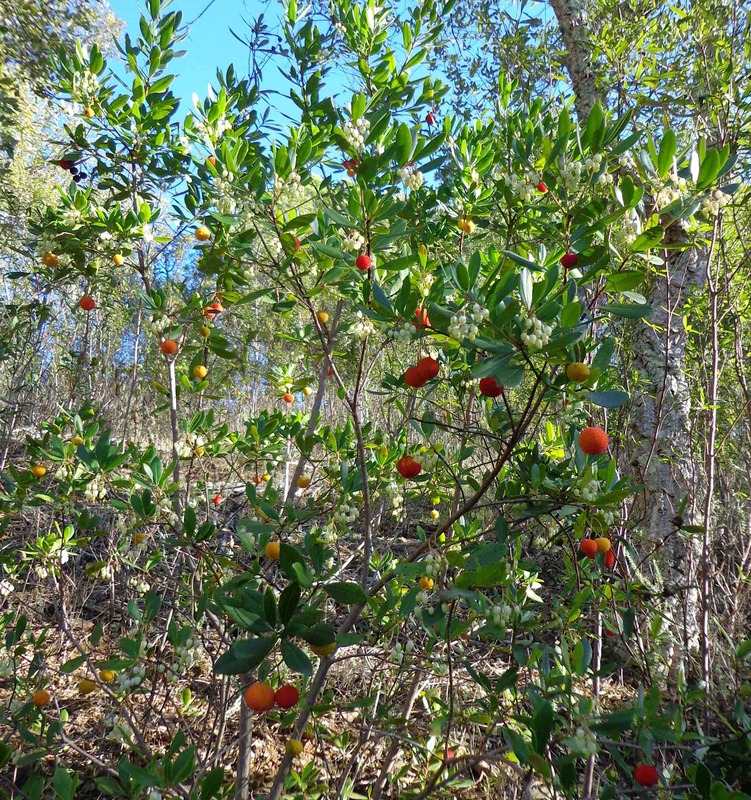 The Strawberry Tree is small, very resilient, evergreen, and drought hardy. 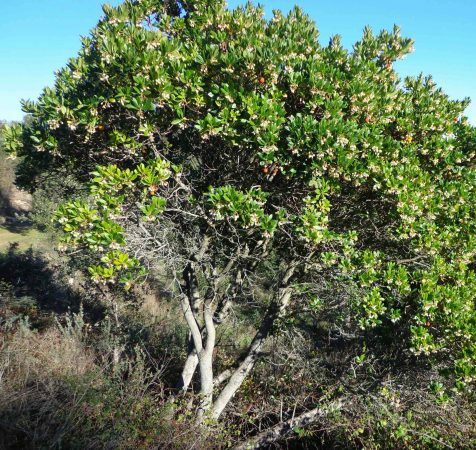 It likes to grow with the oaks and chestnuts as an understory tree and is very important tree for forest regeneration in this area. It is a tree that brings me great joy on my winter walks. It flowers and fruits at the same time, and throughout winter months its colourful fruits and pretty white flowers brighten up the darkest corners of the forest. It provides and abundance of food for birds, animals and bees, and for us humans too. Some people don’t like the soft, granular fruits, but I love them. In Portugal they are used to make liquor – aguardente, called Medronho. Most villages around here will have their own small distilleries, using the same kind of traditional copper alambic stills as I use to make hydrosols. The liquor is strong and slightly psychoactive. I made this essence on the winter Solstice – somewhat of a challenge due to the lack of sunshine hours, and the fact that most of the trees are located in shady places. However I managed to select one tree, located next to a chestnut, with an open area nearby for infusing the flowers. However I could not start the essence making until the middle of the day once the sun had come round. It was a bright winters day with a vivid clear blue sky, and very still. The ground was very wet and cold from a heavy dew. After collecting some flowers, and setting down the bowl in a sunny spot and retreating to meditate, the first thing I am aware of is a dazzling brightness – a sense of light pouring out from the tree – and a feeling of being “drunk on beauty”. The tree has a seductive quality. Its fruits can nourish or intoxicate in how they are used by humans. Below the ground I feel its roots strong, and firm. Its lightness is not flighty or insubstantial. It is a beacon of light through the dark days and can help you find the levity and joy that may be hidden within you. After about 30 minutes of sitting with tree I feel myself drawn deeper and experience a sense of slight altered perception and opening of psychic awareness. I see how this tree can be an aid to journeying / dreaming / dimensional shifting, whilst being anchored to the earth. The tree shows me there is nothing worry about and gives me confidence to open to this psychic field, and to be present to beauty, wonder and magic. After the process is complete and I decant the water into a bottle, I drink the remaining infusion and it has a delicious delicate sweetness. Connects us with true joy and celebration. It can help one find one’s sense of childlike playfulness, and is a good remedy for children when they are sad or low. The energy of the tree acts as a backdrop upon which negative beliefs and excuses for grumpiness are shown up more obviously. Helps one to recognise when you are taking things too seriously. A remedy for grumpiness, stodginess. Breaks up deep patterns of negativity that block joy, transforming negative beliefs. Unrelenting joy. Deserving. Patience with others as they too find their way. For fear of being seen / standing out from the crowd (behaviours of hiding), and for not believing or seeing ones own beauty/gifts/attractiveness, or fearful of showing it. Allows one to recognise own beauty by being true to self, and supports the expression of this uniqueness and beauty into the world, allowing one to shine. Good for supporting all kinds of creativity. Can help open up psychic awareness, and connect to the unseen dimensions of elementals and plant spirits.